This post demonstrates how to set up a very basic message queue using SignalR with SQLite. This could be used to collect data from a measurement system or a client which is not always online but no data messages should be lost or the sequence of the messages. Only the client contains a spool or buffer. If the client is online, messages are sent directly to the server. When the client is DISCONNECTED, messages are buffered to the SQLite database in a FIFO structure. The server controls the client messages. 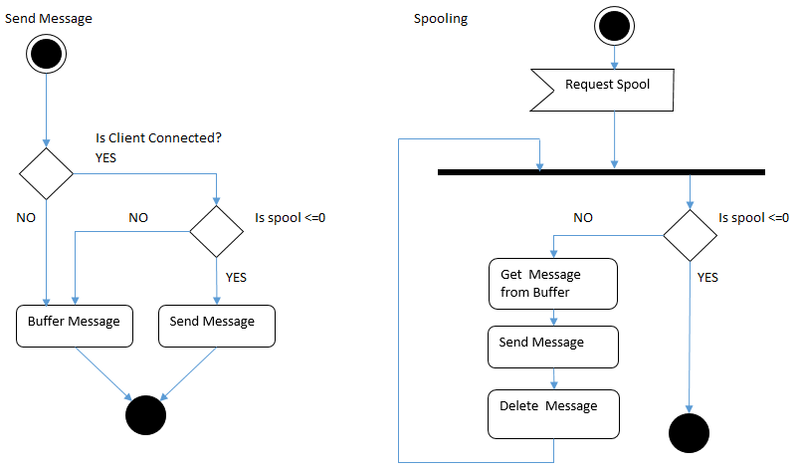 No messages are sent until the server requests the spool/buffer. This ensures the sequence of the messages. Of course this is totally inadequate for a proper data or measurement system. The buffer requires more configuration possibilities, limits etc. For example, what happens if the buffer is full or can the server automatically turn off the spool/buffer. The server component provides a simple Hub with 2 methods, one for sending the data and another one for requesting the spool. String2 = "String2 from Server"
The Hub is initialised using Unity 3 in the start method above. The UnityConfiguration class provides the unity 3 registration. The Damienbod.SignalR.IHubSync.Client Assembly is used as a shared assembly for the client and the Hub. This is not required but makes it easy to implement a client. Interfaces are provided for the client. These are the possible Hub methods which can be used, or the events which are available. The DTOs are also defined in this assembly. This example has only one data DTO. 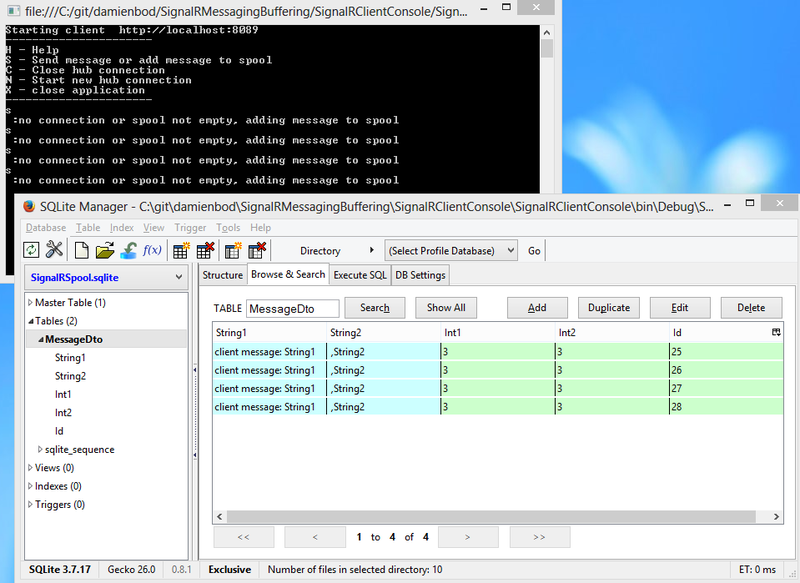 The client is made up of a simple SignalR client and a SQLite database used for the buffer/spool FIFO. The SQLite database has just one Table; MessageDto. This database is accessed using the SpoolDataRepository class. 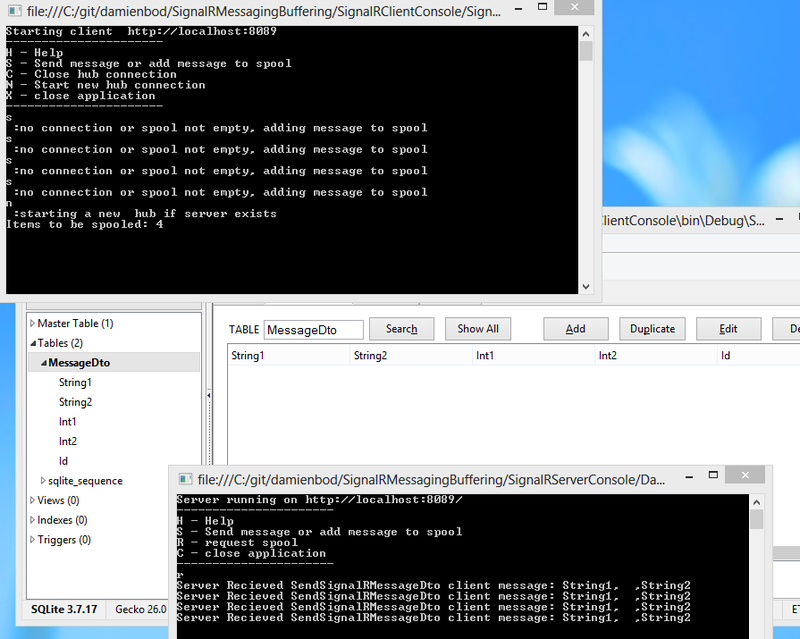 The MyHubClient class is used to set up the SignalR Hub. This class inherits from the BaseHubClient which sets up the standard SignalR settings. The class also implements the shared assembly interfaces. The program class contains the user interface logic and a separate thread for spooling if the server requests it. When running without a server, the messages are saved to the SQLite database.